My Nature series, Part X. Our small lawn was my favourite haunt in my childhood. I loved to spot mushrooms under the hedge, to pop the balsam pods and watch the seeds scatter all around. You needed years of study and experience to know which ones were ready to pop. I'd track the path of butterflies as they flitted around: the yellow and black ones hovered over flowers while the tinier grey ones looked for nectar among the occasional wild flowers in the grass. I would also spend hours watching the caterpillars as they blissfully nibbled bare our lemon plant ... and was forever looking out for snails. Not the slimy, ungainly types. These were wondrous little creatures barely a centimetre in length: blobs of translucent sponge carrying lightly the burden of tiny yellow shells on their backs, nosing around in the soil. I loved the open air then; I am glad to reconnect with nature in pictures now, using my phone camera. We don't have balsam plants around, and anyway I can't bend any more like I could, to peer into flower beds and watch them at work; but I miss those snails. After more than three decades I have, however, encountered some – their larger cousins, and I'd never seen such big ones before – during my morning walks: not a patch on my little friends of old, but snails nevertheless. 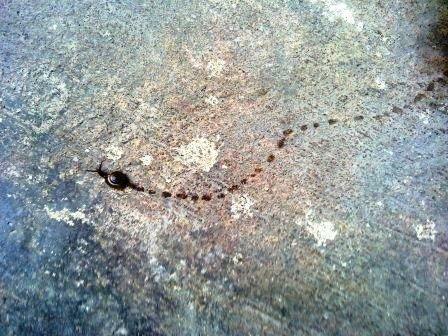 A few days back, this dark brown mollusc was labouring across the path I take every day. To put it out of harm's way, I tried to coax it onto a dried leaf. Conveniently for me, it receded into its shell pronto, and I deposited it near a flower pot. In the twinkling of an eye it had uncoiled and stuck like glue to the edge of the pot. Yesterday, I found three of them taking a morning stroll. For the first time, without an examination in mind, I read up on snails. Apparently they are nocturnal, but may venture out on a cloudy day. But the tiny snails that I remember were morning regulars, getting busy soon after we'd watered the plants and the soil was nicely moist. Snails don't move in a straight line, and leave a trail of mucus behind but the one I clicked yesterday certainly wasn't walking on slime; more like it had been visiting a bunch of fallen leaves still very wet from the night's rain. 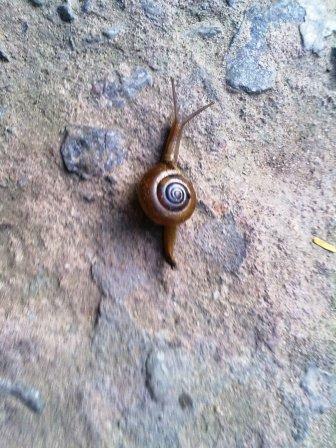 Snails are also, well, notoriously slow; hence the saying, moving at a snail's pace. 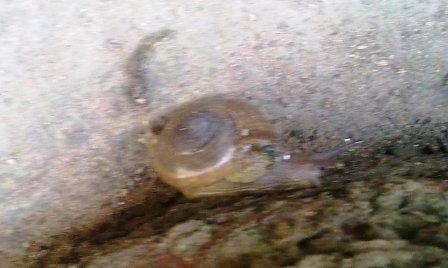 Snail-world.com says "Garden snails are the fastest (of the) species and they can move about 55 yards per hour. While they don’t move fast, they do move at a very steady pace." Despite my girth, I manage to outpace garden snails at least.